Commentary: Is it time for term limits on the Supreme Court? Assuming Brett Kavanaugh is confirmed for the Supreme Court, which, based the Left's voluble wailing appears to be a lock, Donald Trump will have appointed two justices before he's even halfway through his first term. And with two liberal justices in their 80s (Justice Ginsburg is 85, Justice Breyer turns 80 on August 15), the possibility looms that President Trump could appoint a third of the court's members even if he serves just a single term. Given the trend of appointing younger and younger justices, it's likely that Trump's judicial legacy will be felt for another 20 or 30 years. Not surprisingly, this has sparked a backlash from the Left: a call for term limits on the Supreme Court. Though Americans have supported the idea for years, it's never been a cause championed by the Left. Until now. Ezra Klein at the uber-liberal website Vox.com has discovered the advantages of term limits for the high court. "Why It's Time to Get Serious About Supreme Court Term Limits" is the headline at the Washington Post. 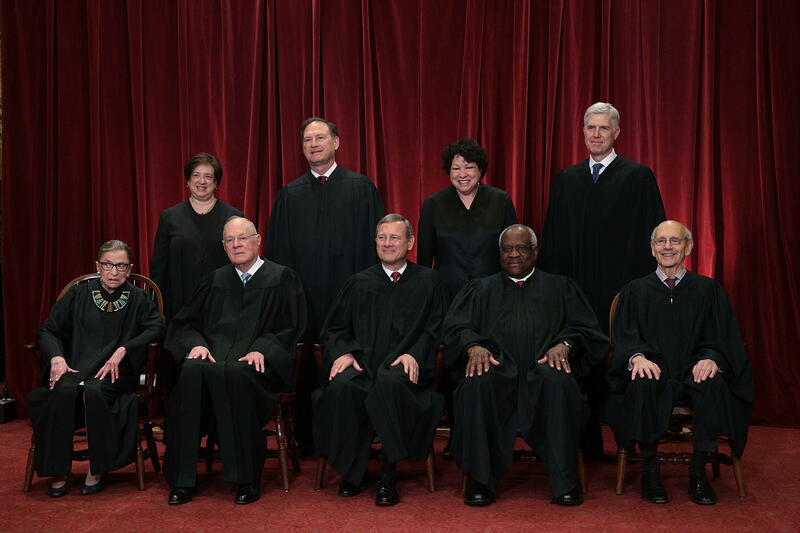 And over on the op-ed pages, Yale University liberals Ian Ayres and John Fabian Witt write that Democrats "ought to consider ending the lifetime terms of Supreme Court justices." "A statute might designate all future Supreme Court seats as 18-year terms, with justices sitting on the court by designation, followed by life tenure on the lower federal bench. The vagaries of justices' deaths and retirements should not throw American democracy into tumult," they write. In a recent Chicago Tribune op-ed, liberal attorney and Watergate scholar James Robenalt joined in, bemoaning that "Trump has a solicitous Senate majority and can ram through his nominees…There is effectively no check on what he can do." Therefore Robenalt suggests a wholesale review of service on the highest court. "Term limits, reconfirmation proceedings every eight years, and age limits — all are viable and rational ideas. It may be time for a constitutional amendment," Robenalt said. The reaction to all this from the Right is to quote that great American legal scholar, Bruce Willis, from the movie "Die Hard:" "Welcome to the party, pal." This is not the view of the newly-minted term-limit fans on the Left. Their support for limiting terms on the court is found in conversations that also include proposals to "pack" the Supreme Court with a new liberal majority when Democrats take power again. In other words, their focus isn't the process, it's the president. Supreme Court term limits are just another part of the Trump #Resistance. The good news for Americans — who overwhelmingly support term limits for Supreme Court justices today — is that, regardless of their motives, the left and right are in agreement on this fundamental reform. Most scholars agree that imposing these limits would require a Constitutional amendment, a long and arduous process. But with partisans on both sides pushing in the same direction, term limits for the Supreme Court could become the most significant, if unintended, reform of the Trump era.